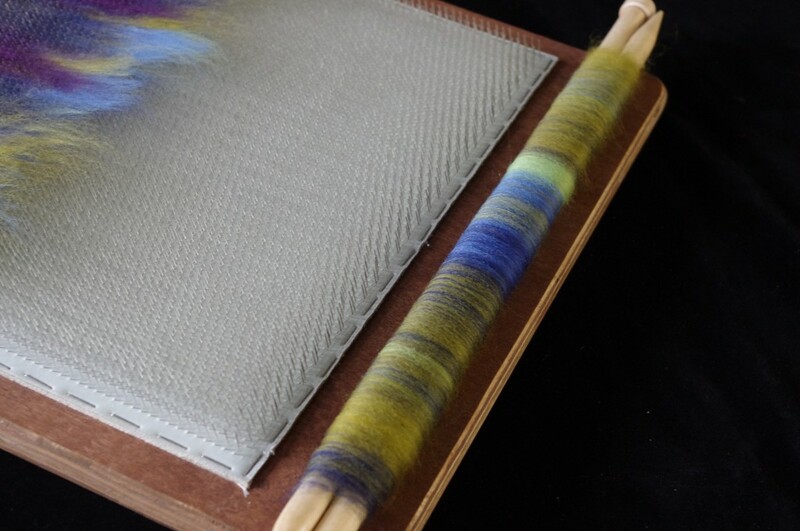 Spinwise blending boards are ideal for blending together different colours and types of fibres. With a generous square foot of working area (29 x 31 cm) they are a useful tool for spinners and felters alike. Each set includes the board, reverse tine packer brush, removable three position swivel keel, and rolag pins. £99 for the complete set, see full details below. The Spinwise blending board has a large 12” x 12” working area, deep 16 mm tines set at 72 ppi and a three position removable keel for best versatility, whether working on the table or your lap. We use birch plywood for stability, which is finished with Osmo Polyx oil and the cloth is secured with stainless steel staples. 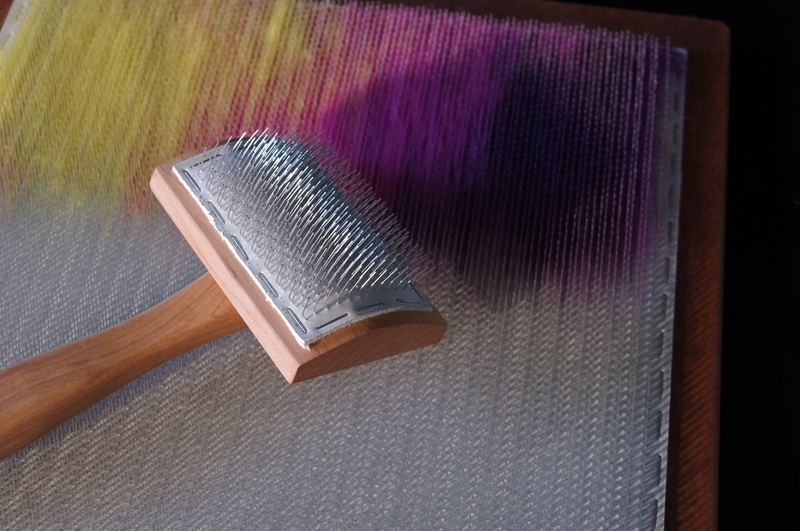 The borders are large to facilitate easy removal of your rolags, the generous bottom edge makes loading the first rolag a breeze and the side margins allow you to brace your thumbs without fear of catching the tines while pulling and rolling. 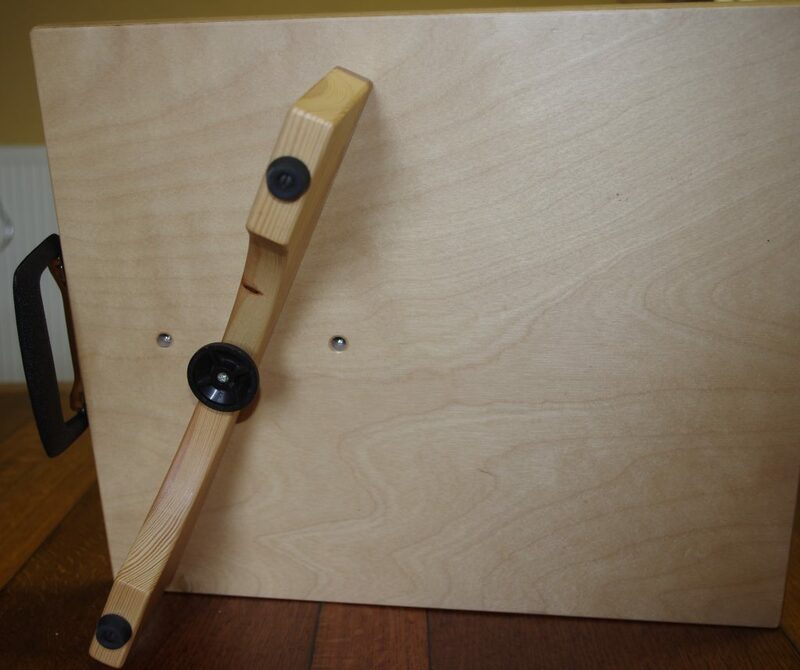 The functional handle at the top of the board makes carrying around much more pleasant than the usual cut out shape. It can swing out of the way too if you want as it is not fixed on its axis. The removable keel allows you to work flat on the table, or in three different height positions. It also swivels to enable you to use it on your lap, with the keel between your knees for stability, the board can turn round to a position to suit you, right or left handed, as you work. The rubber bump stops on the keel prevent the board sliding around on the table as you work. Our special reverse tine packing brush is hand made in sycamore, with an ergonomic handle, twice screwed and glued for secure long term use. One packer brush is included with every blending board kit. 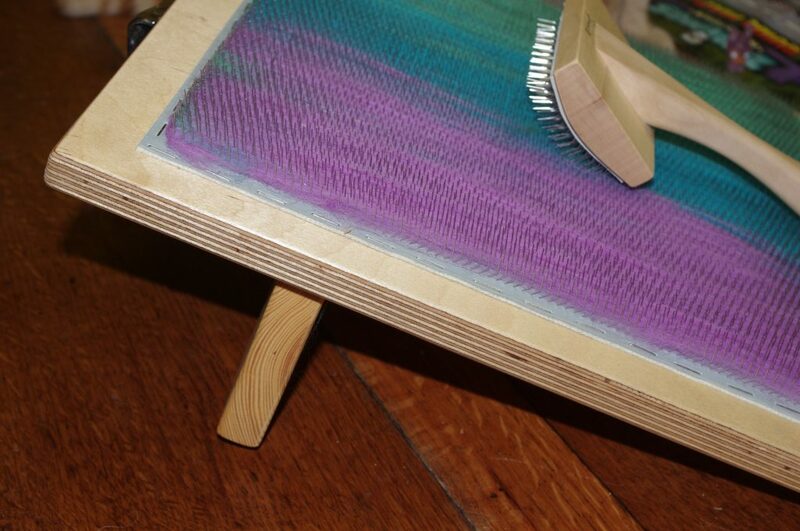 Some manufacturers use bristle brushes which are, we feel, less suitable for use on a blending board. 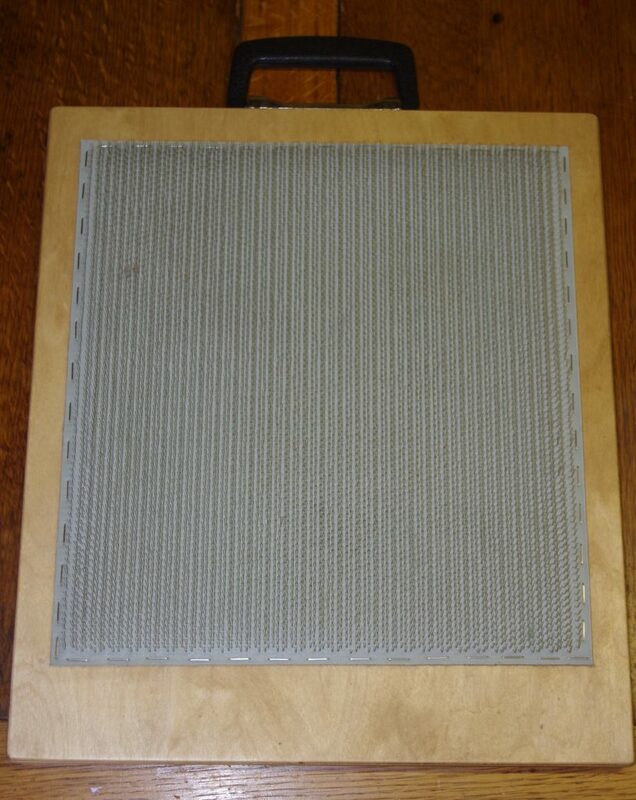 Ours are also suitable for use with other manufacturer’s boards and are available individually, £20 each. 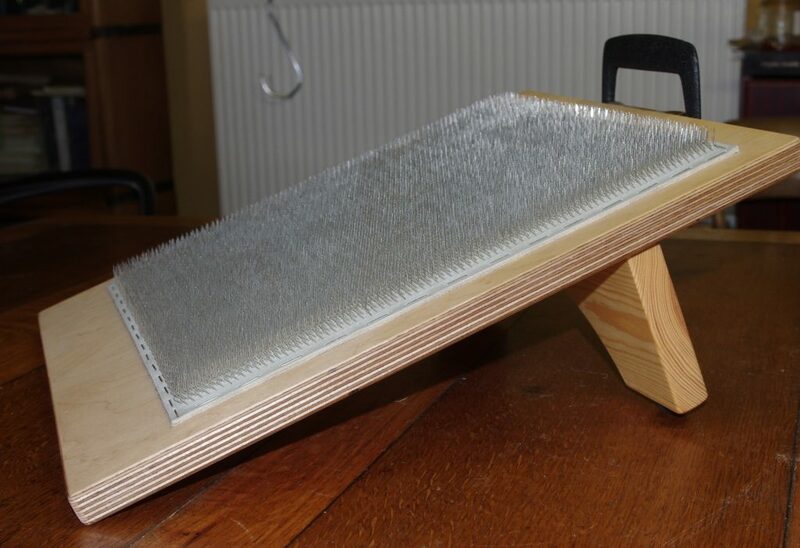 Every Spinwise blending board is also supplied with two rolling off dowels, one large and one small diameter for ease of starting the rolag. Just add fibre and have fun!